Haen Ngu Giaw Sap Magic Snakes Ring of Wealth, treasure and Protection, from Luang Por Im, of Wat Hua Khao. Luang Por Im was an olden days Guru Master, born over 150 Years ago, in 2406 BE, and who passed away more than 70 years ago in 2480 BE.This ring measures 2 Cm Inner Diameter. The ring is estimated to have been made sometime between 2460 and 2470 BE. The Hwaen Ngu Giaw Sap is very old and rare, and is famous for its protective power against snake bites, and its powerful Maha Pokasap magic to attract and retain wealth and treasures. This exhibit is in extremely well kept condition and is a pristine and is in addition, a perfect example to enter for competition. 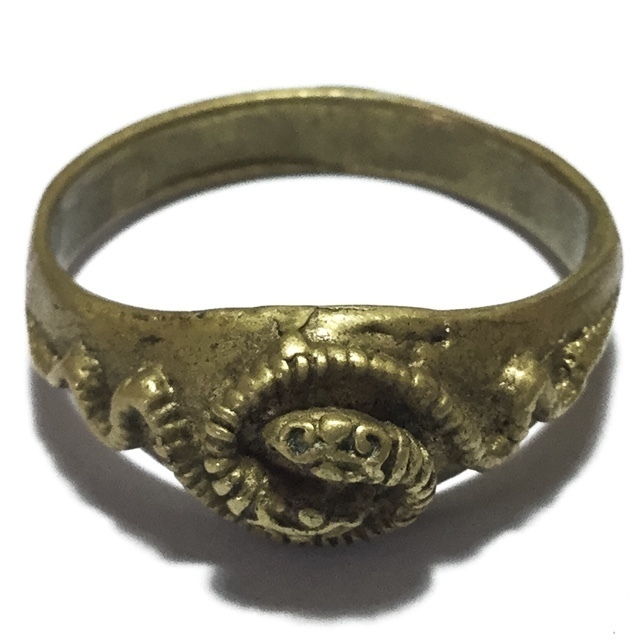 A very rare and highly preferred magic alchemical metal ring using the Wicha Ngu Giaw Sap (snakes entwined around treasures), from Olden Days Miracle Monk, Luang Por Im, of Wat Hua Khao. The Hwaen Giaw Sap is forged from a highly sacred and powerful admixure of alchemical metals and sacred artifacts. The ring itself is formed into the shape of two snakes entwined, in ancient primitive style of bygone eras, and exudes an aura of power through the alchemical metal substance. Famous for Maha Pokasap and its power to protect. The Orphans ran to the Sala, but the elephants were no longer there! When they ran back to see Luang Por Im, they saw the elephant herders bowing to Luang Por Im, and apologizing, admitting their wrongdoing, and asking for their elephants back! Luang Por Im then forgave them and gave them the command that next year, they should return and bring Luang Por Im ten large tree trunks to use as the new pillars of a bigger and better Sala he would build. This is then how the large Sala building at Wat Hua Khao, with its ten ten-ton wooden pillars, came to be built, through the miracle of Luang Por Im. Another miracle which brought Luang Por Im to world fame, was the 'Miracle of Hnang Hinaw' (slippery skin). There were two enemies known as Ta Hnid, and Ta Pan, who decided to have a duel with swords to the death. Ta Hnid was known to have only one testicle, which is believed to bring Kong Grapan Chadtri Invincibility against blades and projectiles. Ta Pan was the nephew of Luang Por Im. The two enemies met behind the Uposatha Shrineroom of the temple at Wat Hua Khaom and using sharp swords, began to fight. They stabbed and cut at each other without restraint, but no matter how many times they hit the mark with each other, nobody was hurt or cut, by a single blow! In the end they became so tired, and still unable to harm each other, that they gave up, and sat down together in truce, and drank some water. He then took the leaf origami fish, filled a bottle with warer, and dropped the origami fish into the bottle. To the total suprise of the devotee, the origami fish came to life and started swimming around in the bottle! Luang Por Im gave the bottle to the devotee and told him to take it to competition, which he did. He won the competition, and took his winnings and the fish home with him. When he got home, he decided to place the fish in a different bottle, and took it out with a net. But as soon as the fish rose above water, it turned back int a folded Bai Jag leaf origami fish. This was yet another amazing miracle of Luang Por Im. There was another story of the time that Luang Por Im came into the monks refectory and told them to hurry up and finish eating their alms, because they were needed to help to bring water to douse out a house fire. The monks asked Luang Por Im what was going on? Luang Por Im told them then, that the night before, some local villagers had broken into the temple grounds to steal fish from the ponds, and that because of this, their houses were going to set on fire today. The monks then ate their food quickly wondering what Luang Por Im was talking about, and as they left the refectory, were surprised to hear a sudden arousal of people shouting 'Fire, Fire', and the monks realised that Luang Por Im had foreseen the event with his psychic powers.